We’ve been obsessed with Not Another Salon on London’s Brick Lane since it first flung open its doors. It’s been another mammoth year for both the rainbow bright salon and its owner Sophia Hilton – having scooped a whopping FOUR awards at the Creative HEAD Most Wanted and IT List Awards in 2017, the most prestigious awards in the world of hair, they hit it big again this year. Boss Lady Sophia (she of the yellow hair fame) has just been named the Most Wanted Colour Expert for a second year running – incredible stuff! Price: Bleaching from £120 with the high-end bleed from £40 on top. The Innoluxe colour additive is £30. 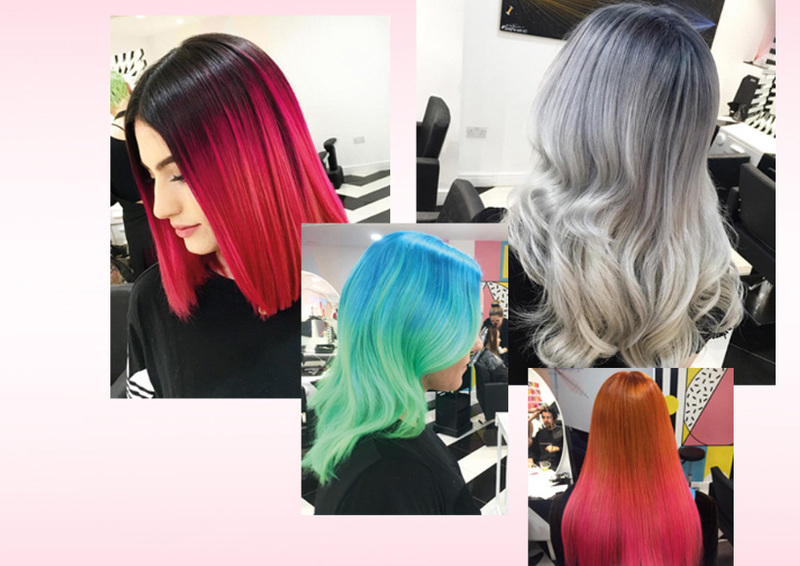 What we say: Take a look at Not Another Salon’s Instagram feed, and I defy you to not fall in love with the technicolour-terrificness on offer! Every thing looks so shiny and luxe, while still hitting the bold colour notes. I’ve experimented with pink and peachy shades, but they’ve been quite subtle, not as full-on as what Sophia has on offer. I was keen to give something stronger a go, and I’ve had my heart set on blue but a DIY test at home nine months ago sent me a weird ashy green, and I was too scared to try again. Sophia and I talked long and hard about my choice – blue is very tough to remove once you want to do something different, and does have a tendency to go green, but she said that if I looked at putting it near the freshly bleached roots, it would work better. We agreed it would then bleed into pink. First up, all my hair was bleached to clean up the tones and give us a fresh base to work on. 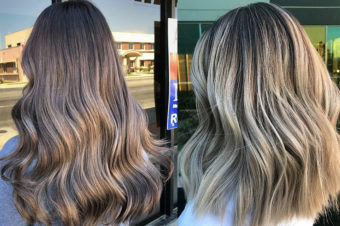 Sophia insists on using Innoluxe, a colour additive that helps to stop damage in its tracks and keep hair healthy, and I can see why – all that colour, especially the bleaching, can leave your hair looking past its best. The bleach was then washed out and the fun colours applied – there’s a line-up of multi-coloured pots to choose from, it’s like being back in art class at school. They are given time to do their magic (Sophia constantly checked the development) and then they were washed out too. A lovely blow-dry and a touch of ghd magic later, and I was ready! 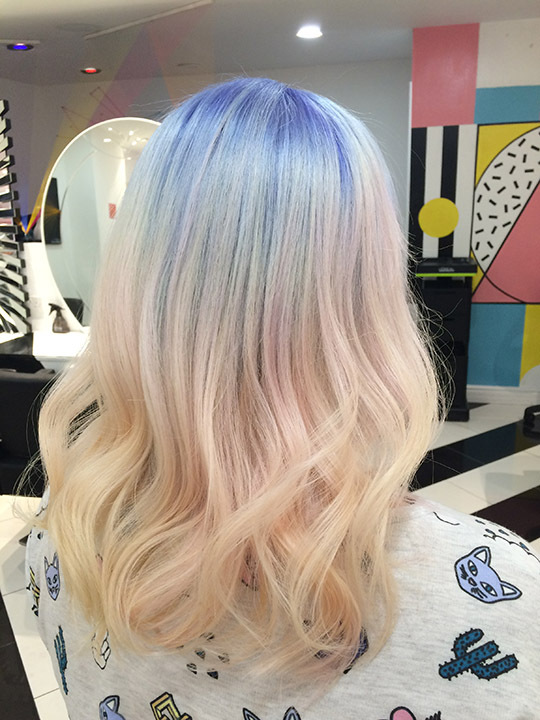 Results: OK, I’ll admit it – when the colour was first washed off, I was terrified. It was SO blue! But once it was blow-dried and then styled, I was thrilled. The pink was subtle, like a little candy kiss and not too girly, and I was amazed at how healthy and shiny it looked – that Innoluxe shot certainly did the trick! When my four-year old daughter saw me the following morning, she squeed: “Mummy, you have mermaid hair!” – that was the ultimate compliment! 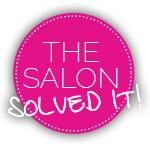 And at last view, my hair garnered more than 1,700 likes on the salon’s Instagram page – WOW! Anything you didn’t like? I have to say, I thoroughly enjoyed the whole experience. I was a little nervous at the idea of visiting this salon – it looks just so damn cool, as do all the staff, and I’m a chunky mum who’s the wrong side of 40. But the salon has a “no judgement” policy, and everyone was so warm and friendly (they even come round with a box of biscuits!). Also, the way the colour area is set up downstairs makes it very communal, and you end up chatting to others while your colour develops, which was really lovely. And this might sound strange, but the choice of reading material was suitably quirky too – I lost myself in a serial killers anthology! Aftercare? Sophia has this sussed – for just £5, you can buy top-up pots of your fun colours to keep you looking fresh. Bravo – such a great idea! We also talked about the best shampoo and conditioner for me (Pureology, which I have at home already) and she said to come back if I needed to have my colours cleaned up at any point. 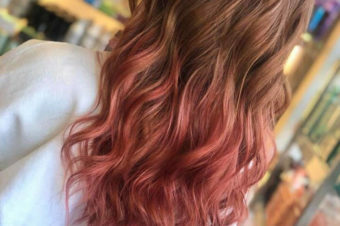 The bottom line: If you love daring colours, and don’t mind the occasional odd look from a befuddled commuter, then Not Another Salon is your ultimate hair destination. Sophia’s deft touch with colour is unmistakeable, and her constantly sold out training courses echo that. With an infectious laugh and no-nonsense attitude, Sophia’s skillset is only growing – and we can’t wait to see where it takes her next.